There are many legends but little known history regarding Kentigern. All the sources are from the eleventh and twelfth centuries. Most are from the northern part of Britain, where Kentigern’s evangelistic and pastoral ministry took place. The sources contain various folkloric elements which are considerably older than the eleventh century, but which have no clear historical value (including in one source a confrontation with the druid Merlin). From these traditions we may with some assurance of historicity assume that Kentigern was the son of a British prince (perhaps Owain of Rheged) and of illegitimate birth. 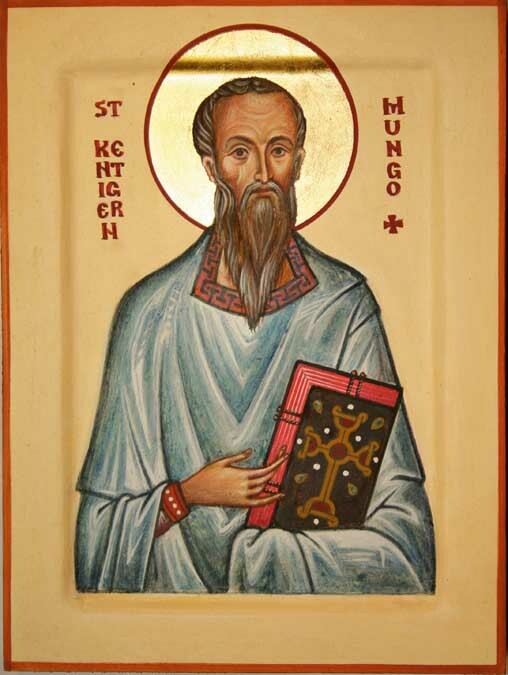 Under his nickname Mungo (meaning “darling”) was educated by Bishop Serf at Culross and became a monk in the austere Irish tradition. He later traveled to the northern British kingdom of Strathclyde (Stratclut), in what is now southwestern Scotland, where he was ordained bishop by another Irish missionary bishop. He continued the work of Saint Ninian in preaching the Gospel to the people in the vicinity of Dumbarton, the capital of the kingdom of Strathclyde, and established a religious foundation near Dumbarton, around which the city of Glasgow later grew. Persecuted by the pagan king Morcant Mwynfawr, Kentigern fled to Cumbria (in the kingdom of Rheged) for some time. On the accession of Morcant’s brother, king Riderch Hael the Generous, he was summoned back by the already-baptized king to continue his work of evangelism among the Britons of Strathclyde. Kentigern likely lived to the age of 85, and he died and was buried at his religious foundation at Glasgow. His relics are claimed by Glasgow Cathedral. Almighty and everlasting God, we thank you for your servant Kentigern, whom you called to preach the Gospel to the people of northwestern Britain. Raise up in this and every land evangelists and heralds of your kingdom, that your Church may proclaim the unsearchable riches of our Savior Jesus Christ; who lives and reigns with you and the Holy Spirit, one God, now and for ever. Amen. Kentigern, Missionary Bishop, is commemorated on his traditional feast day of January 13 in the Calendars of the Church of England and the Scottish Episcopal Church. He is commemorated on January 14 in the Kalendar of the Church in Wales as well as that of the Anglican Church in North America, so as not to conflict with the commemoration of Hilary of Poitiers. The icon of Saint Kentigern is from Aidan Hart’s gallery of Western Orthodox saints and is reproduced here with his generous permission.